Early development in aeronautics has been accompanied by great popular interest and media coverage. This widespread fascination with flight has inspired an enormous output of historical drawings, paintings, advertisements and illustrations for publications. Some of the most colorful illustrations are those which adorn sheet music. In the Bella Landauer collection, you can find illustrations that range from the bizarre to the commonplace, from the humorous to the mundane. But most are colorful and interesting. The earliest known aeronautical song was published in 1785. Entitled Chanson sur le Globe Aerostatique, it depicts a Montgolfier balloon ascending from the Tuilleries in Paris. This piece was followed by countless musical compositions dealing with all phases of aeronautics. "Wrong-Way" Corrigan had his bard, no less than Lindbergh. And there was always someone to opine musically about such disasters as the wreck of the dirigible Shenandoah or the Hindenburg. The importance of music as a mirror of the times has largely been overlooked in aeronautics. It remained for Bella Landauer, a veteran collector whose son was a pilot, to recognize it. She started collecting sheet music in the early 1920's, scouring music shops, publishing houses, auctions and private collections for sheet music with an aeronautics theme. Mrs. Landauer got little help from clerks in music stores, who could usually remember Come Josephine, in my Flying Machine but few other aviation songs. She consulted publishers' lists and personally inspected old musical stock, gradually building up a formidable collection. It's difficult to place a value on such a collection but Major Lester Gardner, former chairman of the American Institute of Aeronautics and Astronautics, proclaimed that some of the scores are priceless because of their rarity, age and excellent state of preservation. Major Gardner also said that "Almost all languages are represented in the collection. Almost every cover in this collection has a lithograph and from these pictures the whole history of aeronautics can be followed." Most of the music written in the early 19th century until the age of the airplane, fell into three categories: songs expressing the author's desire to fly to distant lands or even to the moon, comic songs about ballooning mishaps, or purely romantic songs. There was a tendency to scoff at the free-traveling balloon because of the pilot's inability to pick a destination. Many of the American songs had a predominantly romantic tone. The pioneer days of flying in the United States brought a plethora of music which will be remembered nowhere except in Mrs. Landauer's collection. These compositions include such as Take Me Up In Any Old Plane and Since Katy the Waitress Became and Aviatress. For 200 years, the musicians have been turning out marches, polkas, gallops and waltzes celebrating aeronautics. But the most celebrated event was Charles Lindbergh's trans-Atlantic flight of 1927. 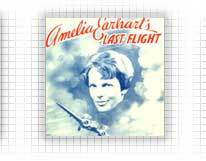 After Charles Lindbergh, Amelia Earhart seems to have been the most popular subject of aviation theme music. However, Byrd, Chamberlin and Post also heard paeans sung in their praise. Martial music occupies a special niche in the Bella Landauer collection. John Phillip Sousa wrote a stirring tune called The Aviators March. The Battle of Marne was a popular piece from World War I. The noted aircraft designer, Major Alexander de Seversky, displayed his versatility by composing Over Land and Over Sea, Song of the American Force. 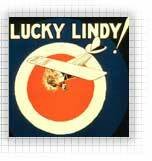 To aviation buffs, the principal enjoyment of aviation music is the cover illustrations. Perhaps the most lurid illustrations are found on the martial pieces such as Battle in the Sky and Luftflotten-Marsch, featuring flaming dirigibles.